Like many of us though, I have rural fantasies. For the twenty years I’ve lived in NYC, my sister has lived a rural life in Northern California. The fact that she’s had chickens, goats, alternate high-maintenance power sources, and a cottage made for Snow White, has probably aided me in not succombing to my own rural fantasies. But I’ve decided in advance, in case I go rural, that the animals I want to keep are one horse for riding, chickens for laying and a couple ducks for my nephew Kenji to love. Honestly, I want goats too, but I think I know better. Dogs go without saying. 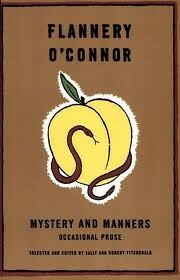 Flannery O’Connor’s collection of essays, Mysteries and Manners, made me realize I may have missed an animal. If you love someone’s fiction, especially someone from the twentieth century, see if they’ve written some essays too. Most likely they have, and it’s a whole other experience to read their personal experiences and thoughts. In her 1961 essay, The King of Birds, we learn how a young Flannery raised chickens since she was 5. And at around that age, she ordered her fist peafowl. Now, I’m gonna admit, I never thought, said or read the word peafowl, and I never thought about the peahens, who naturally are not peacocks, nor had a thought for the chicks, who are delightfully called peabiddies. I love all these words. I now know a lot about peafowl and am officially adding them to my rural fantasy menagerie. They multiply fast and have a great survivial rate. They eat flowers, the more beautiful the better, and fruits and they roost high in trees. They live to be 35 and in all that time will never show in any way they care about you. And they are chickens. Best of all though are Flannery’s descriptions of the emotional reactions they evoke in us humans. She’s seen a lot of people from first grade to elderly awed silent. Dizzy with appreciation is common too- I know I have been in that category. I think as a child I felt so moved by the sight of a peacock’s fanned tail feathers, that I determined that the color and pattern of those feathers were in existentence together in my soul before I ever laid eyes on them. People are often hypnotized by a strutting peacock. Then O’Connor artfully describes those that are “congenitally” unmoved by the sight. And a pretty good variety of people can be angered by the display- she describes a bus driver who stopped at her farm, when he spotted the outspread tail from the road. He approached briefly, incensed, and then returned to his bus. How could this be? I finished reading The King of Birds on my morning subway commute. I had a seat and standing people pressed around me. As I read, I grew aware that my open book pages were surrounded by a border of soft-focus peacock feathers. It dawned slowy as reality. I lifted my eyes and inches from my face stood a big-sized woman wearing a flowing skirt with a peacock feathers pattern. I ‘bumped into’ American writer Rachel Stolzman a few weeks ago. We were both participating in the online course Blogging 101 , and found each other in the usual technological way. That’s to say, entirely fortuitously. I asked Rachel for permission to reblog a piece she wrote about our meeting. She did such a nice job explaining the serendipity behind it, but in the end I was too embarrassed by the kind words she wrote about me. Instead, I’ve decided to reblog a wonderful piece she wrote about reading a Flannery O’Connell essay while travelling on the subway in New York. As it happens, this piece is a further illustration of internet serendipity. I’ve been writing about birds recently and the Flannery O’Connell essay is a lovely tribute to one of the most beautiful: the peacock. Rachel’s post, in itself charming and pitch-perfect, led me to the O’Connell essay, which in turn led me to a wonderful Pathé video of a young Flannery showing off her backward-walking chicken. Very fun post: I learned something I didn’t know about Flannery O’Connor, and, along the way, I learned about your urban life (and what your hypothetical rural life would look like).